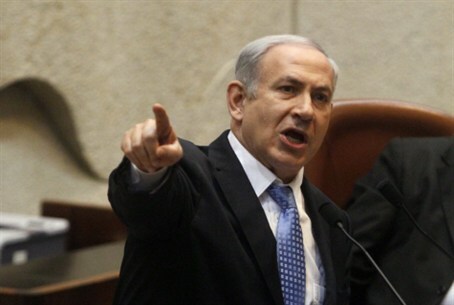 Prime Minister Binyamin Netanyahu says Israel will not hesitate to strike those who seek to harm its citizens. Prime Minister Benjamin Netanyahu responded to recent rocket fire on Eilat from Sinai saying Israel's security establishment was "well aware of the fact that Sinai is turning into a rocket launching pad for terrorists. "We are building a fence. It can't stop missiles but we will find a solution for that. We will strike those who aim to harm us," he said Thursday. Overnight on Wednesday, terrorists fired three rockets at Israel's southern resort city of Eilat. One Grad rocket exploded in a construction site in a residential area in the city. No injuries or damage were reported. Senior security officials decided to put the IDF on its highest state of alert over the Passover holiday – which begins Friday evening – as a result. The move comes one week after IDF chief of staff Benny Gantz canceled the customary Passover leaves saying he did not believe an army should go on holiday. The IDF has been on high alert across the Israel-Egypt border following several attempts to mount terror attacks in the sector. IDF intelligence chief Maj. Gen. Aviv Kochavi echoed Netanyahu’s assessment on Thursday, saying the rocket fire underscored that "Israel must prepare to face threats and instability that could last for years" due to political upheaval in the region. "The rocket fire on Eilat originated in Sinai and represents a fundamental change in the region," Kochavi said. "The Middle East has the highest pace of armament in the world, which is changing its ultimate character beyond recognition." "Terrorist groups continue operate in Sinai and to strengthen their hold there," Kochavi said, adding his division had identified numerous terror cells in Sinai and aided the GSS in stopping several cross border attacks. US ambassador to Israel Daniel Shapiro visited Eilat on Thrusday and said Israel faced a serious security threat from Gaza and Sinai. He reiterated Washington's full support of Israel's right to defend itself.